Since May 2011, the headquarters building of JESA has been crowned with a new illuminated sign. Our old sign still showed the name “JESA Kugellager” which suggested that we were solely a manufacturer of ball bearings. Over the last few years JESA has been looking to the future by placing its expertise in ball bearing manufacture at the service of complex units containing rotating parts, under the “Spinning Solutions” slogan. At the time of this strategic shift in 2003, the JESA logo was changed. So that our origins are not forgotten, the full stop after the letters JESA is reminiscent of the balls found in ball bearings. We have installed this new, very imposing logo to bring our brand image into line with our current strategy. The letters are now twice as tall. In the interests of the environment, LED technology is used for illumination of these letters, which are 2.4 meters high. The completion of this sign is the result of collaboration with a local supplier. The project went without a hitch and the installation without too much wind, fortunately. If you are travelling past Fribourg on the A12 motorway from Berne, glance over to your left at the top of the Fribourg-Sud exit and you will see the letters JESA (Joseph Egger SA) embellishing our building. Have a good trip! 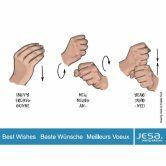 JESA celebrated its 40th birthday in 2009 by inviting employees and their families to an open day at the company headquarters in Villars-sur-Glâne. Much to everyone’s delight, the founder of the company, Mr. Joseph Egger, was also present. The programme included a guided tour of the company by JESA managers. The visitors were able to find out about our assembly solutions combining ball bearings and plastic injection, as well as our production facilities. The day was rounded off by drinks and a superb dinner. Many anecdotes were recounted throughout that wonderful day. It was also an opportunity for JESA to thank its employees and their families for their everyday commitment which contributes greatly to the quality, innovativeness and reliability of our products. A business cannot survive without its employees, something which the JESA management understands very well. On the same day we also celebrated the 40th birthday of the first product to be mass-produced at JESA. This effectively means that we have how spent more than 15,000 days producing over moulded ball bearings for the transport chains industry. What a history! This product is both an example of and testament to the stability of JESA as well as the satisfaction and confidence of its customers. All of this fills us with pride.